Last weekend, Beachside Community Acupuncture hosted a Young Living "Live Your Passion" Rally featuring lectures by local leaders on various topics. Our owner Kathleen Ellerie spoke about using essential oils with acupressure, and this post contains information based on one part of her talk - enjoy! 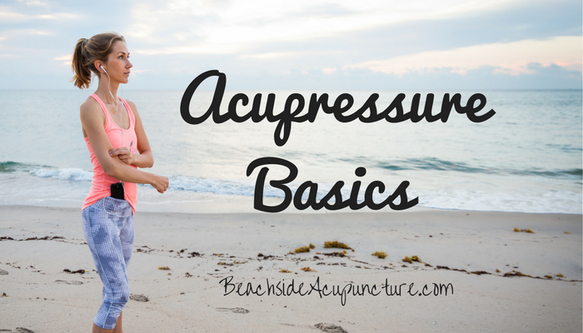 An oversimplified rule of acupressure for beginners is "like treats like". Let's break this down a bit: Say you were dancing and your hip started to ache, where would you focus a treatment? Your first choice would probably be right at your hip where it's aching. While application of essential oils that benefit musculoskeletal health and light massage in that area of pain may provide some relief, there are other parts of the body that will also tell the brain to direct more circulation to the hip. Think of the structure and function of your hip: It's a ball-and-socket joint that connects your leg to your trunk. What other part of the body is similar? Your shoulder! Now where is the hip pain exactly? Front, back, side? Try massaging around the corresponding part of the shoulder (front of the hip -> front of the shoulder, etc.). You may find a few sore spots where your body is calling out for some TLC. Lightly massage these first - there's no need to do any deep tissue work or bruise yourself - and see how your hip feels. Sometimes relief can be immediate, but sometimes it accumulates over time. Using this same technique, what part of the body am I working on in the photo above? The elbow is a hinge joint in the middle of the arm...and the knee is a hinge joint in the middle of the leg. If your knee acts up, start massaging around the elbow to find any sore spots. You might find some that don't make sense with the "back of the elbow treats back of the knee" approach, but still work those too. They're probably just on another meridian that connects to the knee in a different way. Now let's try a trickier one, how where would you apply acupressure to influence the ball of your foot? Picture your hand in relation to your foot: your thumb is like your big toe, index finger is like your second toe, etc. The heel of your palm would be like the heel of your foot (see picture below), and the fleshy part of your knuckle under your thumb is like the fleshy part of your foot under your big toe...what we call the ball of the foot. You may have noticed that although we covered all of the extremities, we're still missing a few body parts. You'll have to expand your mind a little more to figure out the trunk and head, but we'll start with an easy one: Simply use the front (abdomen and chest) to treat the back i.e. massage the lower abdomen for low back pain. Now let's go a little - really a lot - further. This whole time we've been applying the "like treats like" principle on a large scale by using similar joints to treat each other. However, you can also take little pieces of the body and broaden them to affect the whole. This is the principle behind reflexology on the hands and feet and behind auricular acupuncture (using acupuncture points in the ear). Going back to low back pain, think of what your spine looks like as a whole. It's a long column the connects with bigger pieces of the body at the bottom and top (the pelvis and the head). Which other parts of the body are similar to this simplified structure? Really any of your long bones: shin bone, thigh bone, the little bones that make up the flat part of your hand, etc. Your low back is near the end of the spinal column, so massage around the ends of any of these other bones and feel for sore spots! For the head, think of the spine again and how they relate. The head is located at the end of the spine, and if we're using the long bones in the arms or legs to represent the spine, the hands and feet would be what are at the ends of them. Therefore you can massage around your hands and feet for any sore spots when you're having issues in your head. One word of caution here: A lot of people know that point "Large Intestine 4/He Gu" is a great point for headaches. The point is located on the hand and is considered the command point for any issues in the head (headaches, sinus pressure, dental pain, etc.) HOWEVER, it's also one of the best points we have for inducing labor, so NEVER massage this point on a pregnant woman unless she's past her due date and wants to start contractions. There are a handful of other points that we don't use during pregnancy and you need to look them up - just Google "acupuncture points contraindicated in pregnancy" - if you're ever going to massage a pregnant woman. Outside of those few, all other points are completely safe and equally beneficial during pregnancy. Are there other ways to affect body parts outside of this technique? Yes, probably hundreds of them...but these are the very basics. If you come in for a treatment and your Licensed Acupuncturist uses other points that don't make sense with this logic, just know that he or she is using another perspective of looking at the body that can still get great results. If you're not noticing a big difference after using acupressure over a few weeks, consider adding essential oils to the acupressure to give the body even more support or coming in for acupuncture to create a deeper impact on these points. Always exercise caution when starting a new health routine; massage the points very lightly, especially when working on others and especially if you're working with pets, children, the elderly, someone recovering from a serious injury, or anyone who is weak and/or bruises easily. This post was meant to be a guide to inspire you to explore how you can help your body heal itself, but please continue to do more research on proper technique. 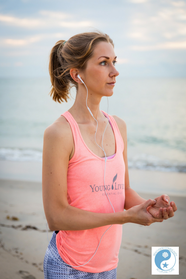 The body has an immense strength and capacity to heal, but our daily habits can stress and exhaust it. Be gentle with it and always seek professional help when needed!